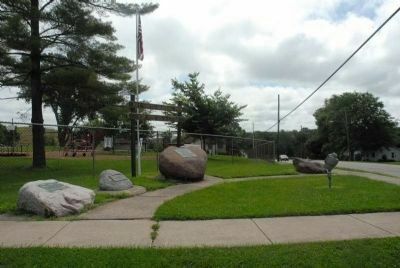 In memory of Bureau County Pioneers. Sunk the first third Vein Coal mine in Hall Township in 1879. Sold in 1888 to C.W. & V. Coal Co. Mine closed in 1913. 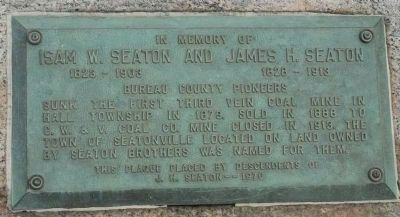 The town of Seatonville located on land owned by Seaton Brothers was named for them. This plaque placed by descendents of J.H. Seaton, 1970. Location. 41° 21.867′ N, 89° 16.503′ W. Marker is in Seatonville, Illinois, in Bureau County. Marker is on Princeton Street (U.S. 6) near East Street, on the right when traveling west. Touch for map. On corner. Marker is in this post office area: Seatonville IL 61359, United States of America. Touch for directions. Other nearby markers. At least 6 other markers are within 13 miles of this marker, measured as the crow flies. Cherry Mine Disaster (approx. 5½ miles away); Owen Lovejoy Home (approx. 9 miles away); LaSalle City Hall-1906 (approx. 9.7 miles away); La Salle-Peru, Illinois (approx. 9.8 miles away); Dr. Paul Carus / Dr. Daisetz Teitaru Suzuki (approx. 10 miles away); James Butler "Wild Bill" Hickok (approx. 12.2 miles away). The wind under our wings. 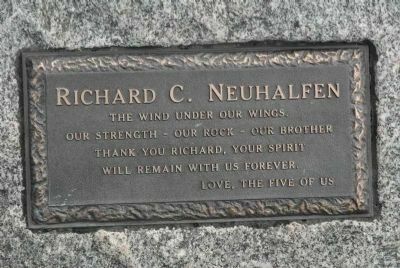 Our Strength-Our Rock-Our Brother. Thank you Richard, your spirit will remain with us forever. Love, the five of us. 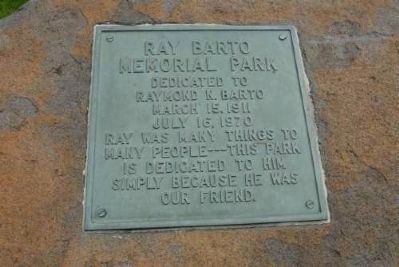 Dedicated to Raymond N. Barto, March 15, 1911, July 16, 1970. Ray was many things to many people--This park is dedicated to him simply because he was our friend. 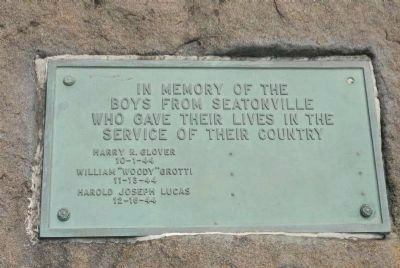 In memory of the boys from Seatonville who gave their lives in the service of their country. Harry R. Glover (10-1-44), William “Woody” Grotti (11-13-44), Harold Joseph Lucas (12-18-44). More. Search the internet for Isam W. Seaton (1823-1903) and James H. Seaton (1828-1913). Credits. This page was last revised on June 16, 2016. This page originally submitted on July 8, 2011, by Charles T. Harrell of Woodford, Virginia. This page has been viewed 671 times since then and 6 times this year. Photos: 1, 2, 3, 4, 5. submitted on July 8, 2011, by Charles T. Harrell of Woodford, Virginia. • Bill Pfingsten was the editor who published this page.